Amy magnanimously offered to wait in line at Franklin while we went to visit Louie Mueller Barbecue, on one condition: we were to rent her one of the lawn chairs from the guy across the street from Franklin. It was a fair requirement, so we left her with the chair and the leftover donuts and headed up again to Taylor. I hadn’t managed to arrange a meeting with Wayne Mueller at Louie Mueller, but we got lucky: as we walked across the parking lot, he was just walking to his car. He recognized us, and we had a pleasant chat for a few minutes. We got to commiserate over the fire that had consumed their smokers. 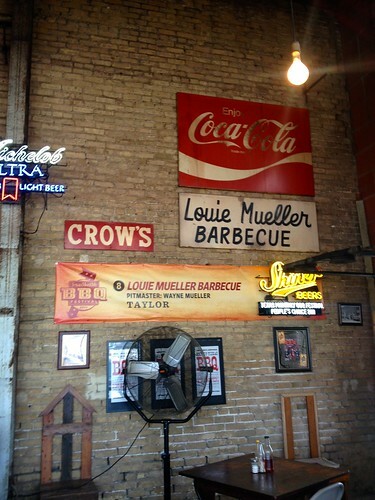 Louie Mueller’s really looks the part of an old Texas barbecue joint. 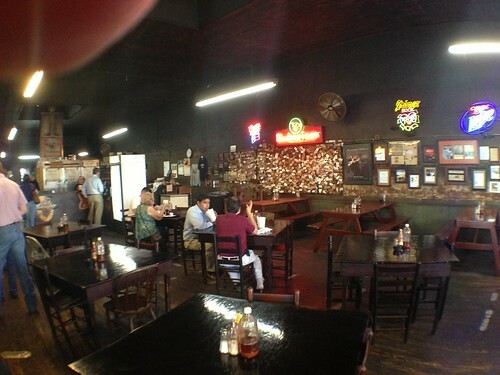 The walls are bare brick, blackened from years of smoke, decorated with barbecue awards. The tables are mismatched picnic benches and school tables, and they do not look like they were carefully chosen for artistic effect. A corkboard on one wall shows geologic strata of business cards progressively dyed by smoke. I don’t know whether it takes a month or a year or more to turn a white business card brown, but the effect was one of palpable age, like being at a family reunion and seeing children’s faces echoing those of their grandparents. We rejoined Amy at a park in east Austin, each bearing our packages of meat to share. The barbecue from Franklin Barbecue was exceptionally… well, I would try to make it sound better with a word like ‘moist’ or ‘unctuous’, but the real word for it is greasy. (But in a good way!) The grease soaked through the pink butcher paper in a way that no other barbecue on this trip had done, and it left a sheen of grease on the picnic table. My picture of the brisket makes it look like sort of a mess. But it tasted and smelled great. - Franklin’s brisket was qualitatively different, and that is noteworthy. I would have a very hard time distinguishing the briskets from the other five places we ate, but I think that I could single out Franklin’s in a blind taste test. The difference was this: all the briskets had a surge of flavor when first tasted, but Franklin’s brisket released a second wave of flavor after a second or two of chewing. 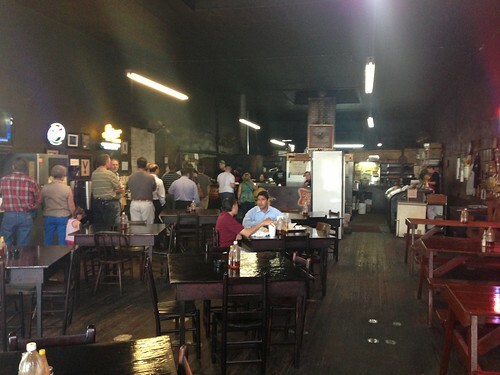 - the brisket was tender and moist and had a very rich, complex flavor. 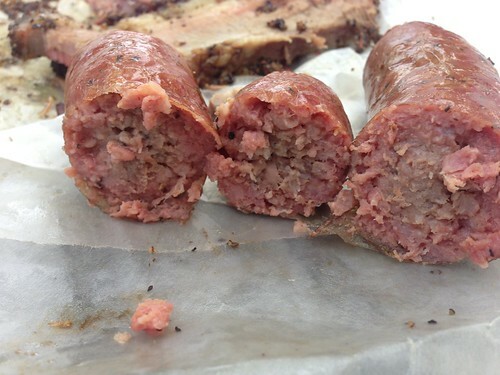 In this picture of bark from Franklin Barbecue, ogle how dark the smoke ring is and how peppery the crust is. It certainly is great barbecue, but I have little patience for waiting for hours in hot shadeless sun. 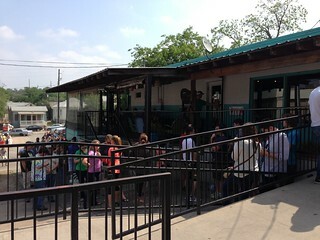 I think that with lines like Franklin’s, I could be just as happy going to Micklethwait a few blocks away. We then turned our attention to the brisket from Louie Mueller. Wayne might say that the smokers still needed a few decades of seasoning, but this was just as delectable as what we remembered from the Roadfood festival. It’s so close to the center of good Texas barbecue that it’s hard to find really distinctive qualities to describe, but we couldn’t identify a clear winner between the two meats on the table. 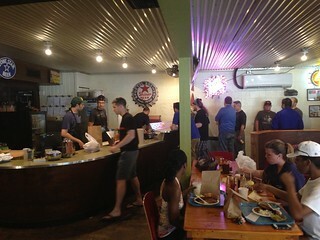 We sampled normal and chipotle sausages from Louie Mueller, and both were smoky and intensely flavored. Amy had brought a bourbon banana tart sold at Franklin’s, but it paled compared to the glory of the meat. The peach cobbler we had brought from Louie Mueller was similarly ordinary, with a texture more like a bread pudding than like the biscuit-topped cobbler I love. This was the last great meal of our Austin plans, and it certainly was a glorious finale.